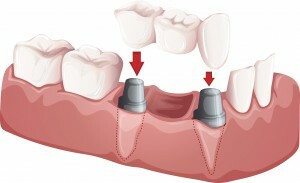 A crown, also known as a cap, is a type of restoration which covers a tooth or attaches to a dental implant. A crown is typically bonded to the tooth with a dental cement, and may be attached to a dental implant by a screw or by dental cement. Crowns restore the appearance and function of decayed, cracked, or broken teeth, as well as teeth that have had root canals. A bridge can be made to replace a missing tooth, which consists of two crowns attached to a fake tooth (a pontic). How Are Crowns and Bridge Done? Am I a Candidate for Crowns or Bridge? Crowns may be a good option for you if you have teeth that are badly damaged or worn, require or desire major changes in size, shape, or alignment of teeth, and are committed to practicing good oral hygiene habits. Crowns can be treated like regular teeth. Like regular teeth, you can still get cavities underneath a crown so it is extra important to brush, floss and use fluoride. Since they are most frequently made of ceramic, crowns can fracture. Avoid chewing ice and biting your fingernails. A nightguard might be made to help protect your crowns from fracture, especially if you clench or grind your teeth. Call New Jersey Monthly Top Dentist, Prosthodontist, Dr. James Courey or Dr. Joseph Zagami to see how your dental health and appearance can be improved: 732-577-0555.